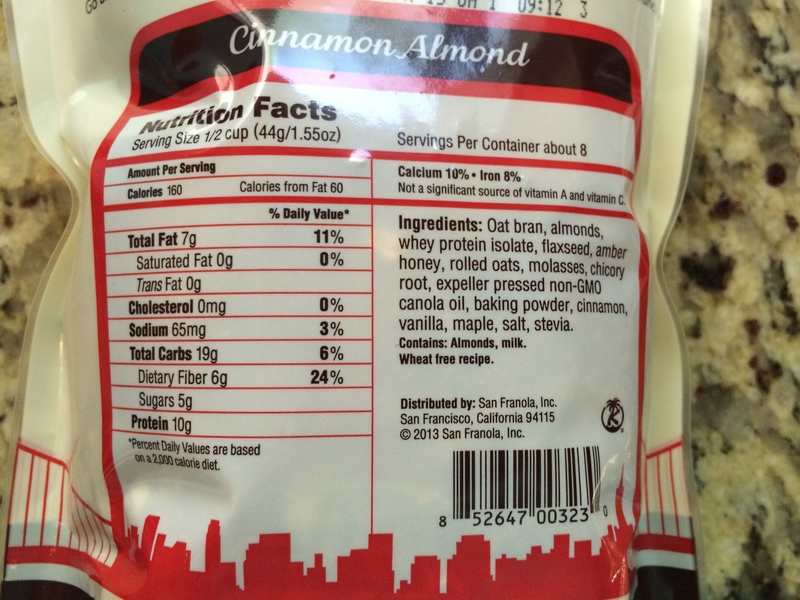 San Franola Granola, I am not sure how it happened but I am glad that I stumbled across this stuff. As I have mentioned multiple times this year I am attempting to make an effort to get in shape and to eat better. For me personally eating better means eating less junk; soda, fast food, and all of that stuff that normally falls under the category of things you want to eliminate when you want to “eat better.” For me eating better means more fruits and veggies but most importantly adding more protein to my diet. You wouldn’t expect granola to have much protein but this product boasts 10 grams of protein per serving…. ah-mazing! After playing around on their website and reading some reviews about the company I decided that I really needed to get my hands on some of this granola. 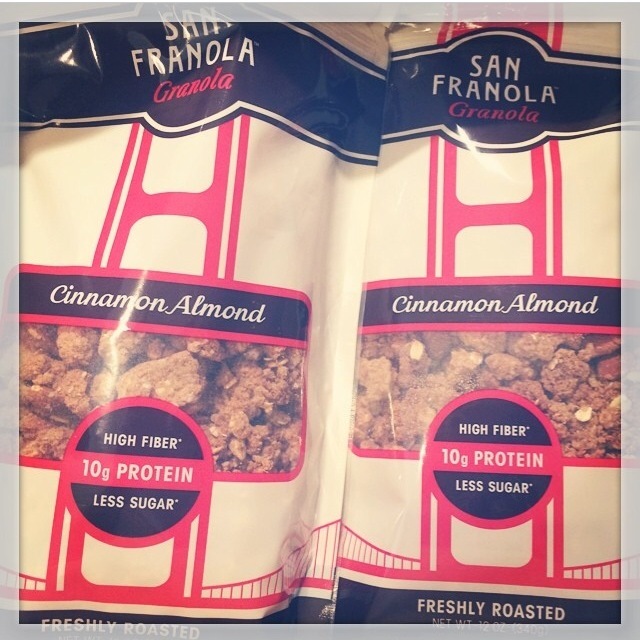 San Franola Granola is carried in select grocery stores but none of them were in my area so I opted to shop online. The company has 5 flavors; California Raisin, Lemon Zest, Ginger Snap, Toasted Chia, and Cinnamon Almond. Seriously everything sounded delicious and I was really hoping that they offered some sort of sampler pack of all the flavors. So I looked at their online shop; six 12-ounce bags or 4 12-packs of single serve boxes… wait a second 6 bags or a ton of single serves of the same flavor? That cannot be right, so I emailed the company; let me note I believe it was a Sunday morning or a Saturday either way it was an early weekend morning and they got back to me almost immediately. I asked if they had a sampler pack, they did not but said they would keep an eye for my order and throw in some samples of other flavors for me, score! So back to the drawing board; which flavor? 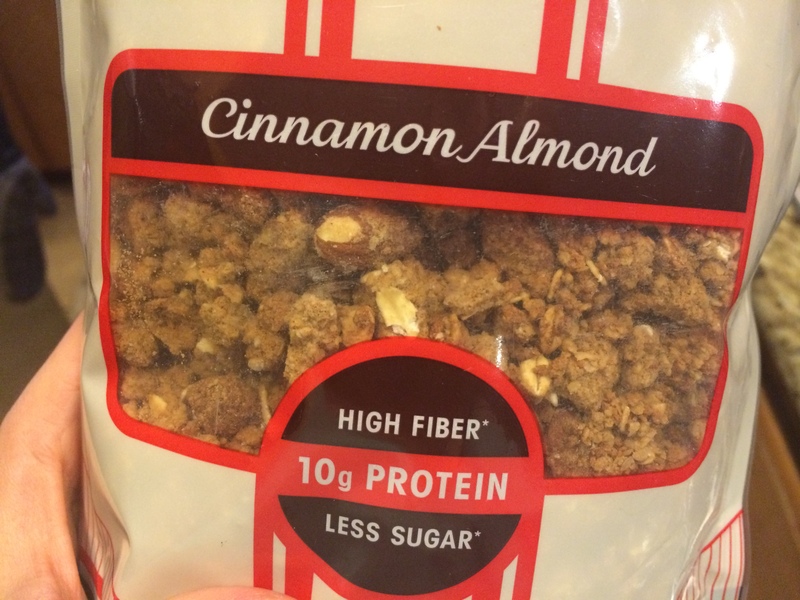 Everything sounded so delicious but I ultimately went with the Cinnamon Almond, their original flavor. The way I see it is that if a company has an original flavor always go with that one. The other ones did sound so good especially the Lemon Zest but original flavors in my opinion tend to be tried and true. I placed my order for the 6 bags and anxiously awaited for them to arrive. Probably about a week or less later the granola arrived; I couldn’t wait to try it. (I just wanted to note that I did not receive any other flavors to try and honestly I can’t hold that against these guys they have a business to run and I don’t expect them to remember me) The packaging of the granola is so fun and simple and very San Francisco, Golden Gate Bridge, a little downtown scenery on the back of the bag. I love San Francisco and I think that even though this is just a package for granola it is a good representation of the city. When you first look at the granola through the little peephole on the bag, it doesn’t look like what we are accustom to granola looking like. I am not even sure how to describe it, so take a look for yourself. Before I even gave the granola a fair test I already started to size it up, thinking it looked super cinnamon-y and was probably very bitter and not delicious like a lot of “healthy” foods can be. Sooner or later I had to open the bag so I opened it one day when I was in a rush to get to work, measured out 1/2 of a cup in a little baggie and hit the road. I remember having an open water bottle next to me on my drive just incase the granola needed to be washed down super quick, but to my surprise it didn’t need to be, it was DELICIOUS; just the right amount of cinnamon, almonds galore, and even better the whey protein that they use in the product didn’t leave a funky aftertaste in my mouth. 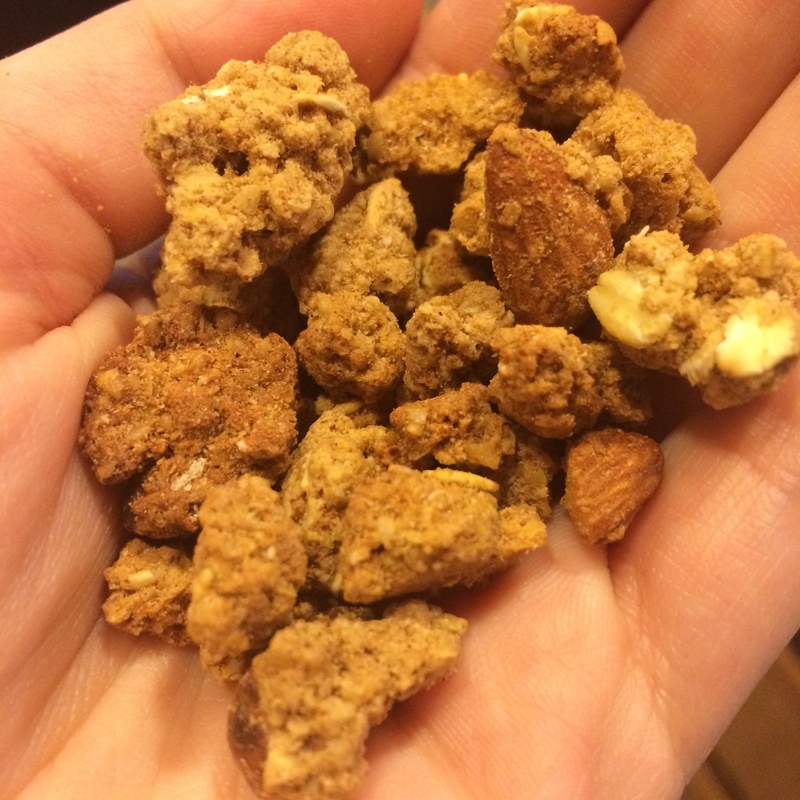 I fell in love with this granola at the first protein-packed bite. Because I can get super excited about new things that I love I like to tell everyone about them and make everyone try it. I made one of my coworkers try it and she liked it, so I gave her a bag. And get this, Marlboro Man was rummaging through my lunch bag and found a ziplock full and decided to try it and even he liked it, so I gave him a bag as well. Marlboro Man is a meat and potatoes kind of guy so it is kind of amazing that he liked the granola and he wasn’t even turned off about how much better it is for you than other granolas. I am on bag 3 of my granola order and I cannot wait to order again, I think this time I am going to try the Lemon Zest flavor. If you love granola but want something with less sugar and guilt I highly suggest trying these guys out. If you are local to a Whole Foods or Safeway you should check and see if they stock San Franola Granola. I promise that your mouth will thank you. I was just checking their website as I was writing this and there is a little note saying that they are sold out for the time being, that should be a sign. And before I forget here is the link to purchase some goodness for yourself.